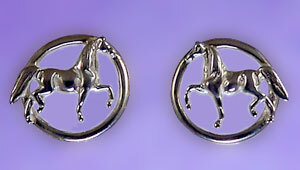 National Show Horse earrings cast in sterling silver. Your number one source for National Show Horse jewelry! Here we have a wonderful design just for the National Show Horse lover. Complete with frame and fabulous two dimensional features makes this horse easy to recognize. Dimensions: 5/8 inches x 5/8 inches. PICTURED AND PRICED IN STERLING SILVER.